Zebra’s S4M printer proudly wears the Stripe series name. 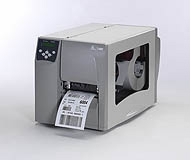 Offering ease of use, a metal construction, and a variety of connectivity options into a thermal printer that takes a full 8″ roll of Zebra labels for fewer media changes. Designed for the budget-minded, the S4M has the features needed to support many applications at an affordable price. With easy controls and proven side-loading design, it’s quick to learn, use, and load, so operators can focus on more productive tasks. The printer offers standard serial, parallel and USB connectivity, as well as optional internal 10/100 Ethernet and IEEE 802.11b/g wireless networking for simple integration and remote monitoring, plus it can be ordered with different printer programming languages. Compared to similar printers on the market, the S4M thermal printer is an outstanding value.